When Nicole Tschirhart landed a job at a traditional public school four years ago, she happily left the for-profit charter where she had worked for three years in an unsupportive setting she considered more business-like than nurturing. But she didn’t immediately join MEA when she started at her new workplace. She didn’t see the value of a union during her first two years teaching kindergarten in West Bloomfield School District—until an incident occurred where she felt a need for backup in dealing with administrators. Tschirhart signed up for membership just over one year ago, and she’s never looked back—except to pull in others like her who didn’t understand the importance of belonging. By November, she had brought in about 30 new members through a new MEA initiative. “A lot of new hires don’t join the union because they don’t know what it has to offer, and nobody has approached them to talk about it,” Tschirhart said. That basic truth is the idea behind MEA’s statewide organizing initiative, Get in the Green, which breaks down the process of building our union’s strength into member-led one-on-one conversations at the building level. The strategy was adapted from an Indiana plan that MEA’s 10 field organizers learned about at the Midwest Organizing Summit last June. Named after color coding that labels local units’ membership density as red, yellow, or green, Get in the Green launched this fall. 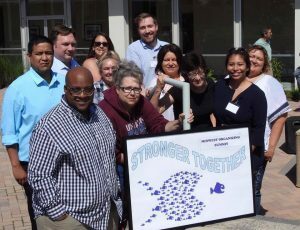 The field organizers were so excited by Indiana’s streamlined process, they returned from the summit, sold the plan to MEA leadership, and organized a summer training of 10 members willing to engage new hires in seven locals for eight weeks—in addition to other ongoing efforts. MEA’s field organizers adapted a new initiative—launched this fall—to tap into and build upon our union’s existing strength. The 10 trainees used Get in the Green strategies to exceed the group’s goal of 70 new members in two months. The group signed up 171 new members in July and August, found 85 natural leaders in their locals, and planned 10 events with 582 attendees. “This is one of the great joys of our work is seeing the fire in the eyes of folks on the ground,” said Jessica Lumberas, MEA field organizer. One-on-one conversations are not new or radical—MEA’s organizers, local leaders, and field staff do that work every day. What Get in the Green provides is a step-by-step guide to get more members involved and show them how to talk about membership with employees they know. Get in the Green explains how to map school buildings to identify natural leaders who are highly respected among colleagues and could become more involved. It also provides answers to questions that come up during conversations and ideas for events to bring people together. “The beauty of it is the simplicity,” said Mary Aldecoa, MEA field organizer. Just as many non-members are never approached to join the union, many existing members are willing to do more to strengthen their locals and get involved in tackling issues—but no one has asked them to help. MEA staff who’ve begun Get in the Green trainings say they’re finding huge untapped potential in units across the state. It’s the definition of organizing forces: the energy already exists for those who can marshal it. “People are worried about these big issues affecting their locals and their work in the classroom, and they’ve been waiting for someone to say, ‘Come on; let’s do this,’” Lumbreras said. Bigger numbers mean bigger power for members to have a voice in policymaking or a stronger hand at the bargaining table. 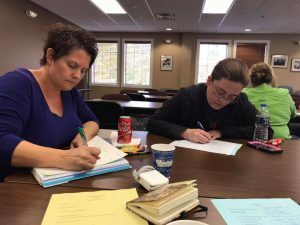 Nobody knows that better than Jamie Pietron-Oldenburg, president of the Anchor Bay Education Association which straddles St. Clair and Macomb counties. Pietron-Oldenburg marshaled her forces to leverage pay increases this fall after she began organizing around a contract reopener that turned contentious. Through one-on-one contacts, she added members, streamlined dues payment, and increased member involvement. Teachers wore blue at community events and meetings. They stayed together and stepped up, and the unity decreased the fear of speaking out. More conversations led to parents and business leaders joining the fight who said they didn’t know teachers were locked in a six-year step freeze while being asked to shoulder huge increases in health care premiums and deductibles. Soon hundreds were packing into school board meetings. Eventually the two sides settled on a contract that included a 2 percent salary increase and restoration of steps. Pietron-Oldenburg says individual contact is key to organizing, and it’s important to do more listening than talking because people are frustrated and want to be heard. She often followed up with notes of encouragement. “I did everything I could to restore their dignity and make them feel appreciated, because they didn’t feel appreciated by the district,” Pietron-Oldenburg said.